Later Gator! - Stop staring and start sewing! I hope everyone had a wonderful Mother's Day! I had a fairly peaceful day (well, as peaceful as one can get with 5 kids in the house) and the smoke detector only went off once so that's always good. 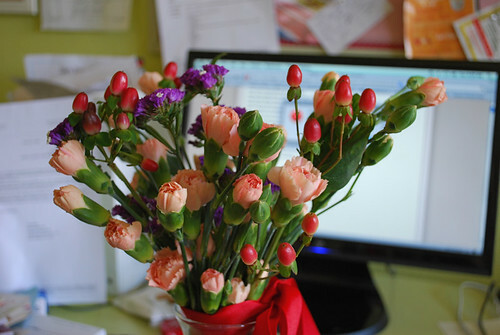 I'm still enjoying the beautiful flowers Peety got me. Great colors! All right! I think I'm ready for Quilt Market! It looks like the weather will be fairly reasonable (in the 70's and raining off and on) so I think I have the right clothes for Pittsburgh. I made two tops using Butterick 5487 (slightly modified) and I'm very happy with them. I may try tweaking this pattern into a dress for summer. The straps aren't bulky but they cover my bra-straps and that makes me very happy! Sorry for the dark picture, I finished the bottom one too late to get good light. I know they are lightweight tops but I'm wearing them under other things and I wanted some things I could wear here in the Arizona summer. 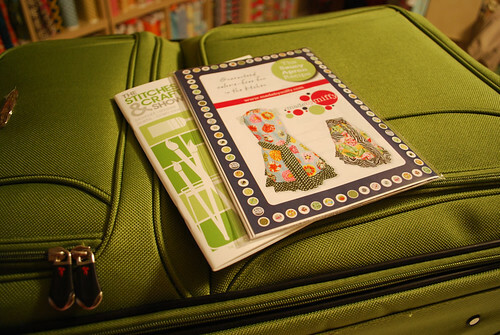 I threw the Stitch magazine in the picture so you would have some recommended reading whilst I'm gone. :D There are some great patterns included in it and some of them are from my favorite designer/blogger friends (whom I hope to see this weekend!). There's a gorgeous pillow by Kay (using Paula's fabric) and a terrific twirl skirt from Chelsea (and lots more). One thing I absolutely love about having a blog is all the amazing friends I have made from all over the world (I love the internet!). If you are in the states you need to make some friends in Australia because then you will always have someone to chat with when you're up in the middle of the night. My friend Louise honored me by using my Apron in an Hour tutorial at The Stitches and Craft Show in Brisbane a couple of weeks ago. Her class was called "Return of the Housewife" (no not "Return of the Living Dead" even though every housewife feels like that now and again). Check out all of the gals wearing their aprons. I've gone international!!! She even sent me my own show guide where it says "You'll make an 'Apron in an Hour' using America's Jona Giammalva's easy pattern." I know, not "America's sweetheart" but I'll take it! Louise has just released a beautiful apron pattern of her own and I should have them in the store next week. But she did send me one to share with my readers (and it's nice!) so be sure to leave a comment (make it an Australian comment if you dare!) and I'll randomize everyone on Sunday. 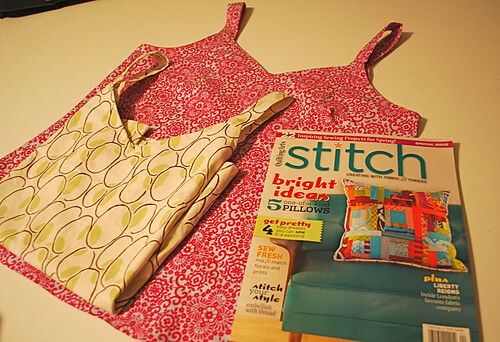 Here's a peek at the apron pattern. That's my green suitcase which I am busy packing (or will be in a minute). Isn't that a great color? Okay, I have to get up in the dark to make it to the airport. Tomorrow I'll take some dramamine to help me not barf (seriously, you do not want to sit next to me on a plane) and maybe it will knock me out for a bit. I'll be back blogging Monday with some great pictures and all the fabric news that's fit to print (and maybe some good dirt that's not fit to print but I'll print it anyway!). And I'll have lots of good Quilt Market swag (which I just found out stands for "stuff we all get") to share so there will be give-aways alllllll week long! Have a wonderful rest of the week and weekend! !